Yesterday started off with a trip to the Museum of Oriental Ceramics with Angelica, who met me after breakfast at my hotel. The museum is ingeniously designed to show off some pieces using natural lighting only, which is filtered through hidden skylights behind the displays. You can see examples of ancient Chinese, Korean, and Japanese pottery, and although the English descriptions are sparse the artwork speaks for itself. Unfortunately, pictures are not allowed. After the museum we headed off to the main attraction for the day (and highlight of the trip so far!) 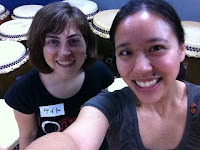 - a Taiko drumming lesson (thanks Groupon)! All that drumming worked up our appetites, so we headed back to Umeda,where Angelica remembered there were some places on top of the Yodobashi Camera. 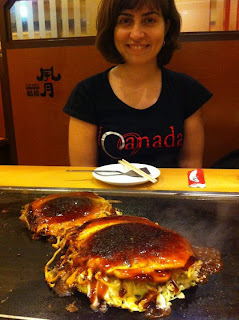 We ended up having delicious Osakan-style okonomiyaki with ika and buta (pork), which is different from the Hiroshima-style okonomiyaki I've had before - it's much less battery and the batter is mixed with the toppings, whereas Hiroshima-style okonomiyaki has the batter and toppings separated more. Again, I found the portion sizes much larger than I remembered, and we couldn't finish everything (we had two sets - each came with one okonomiyaki, two onigiri, and a bowl of miso soup). My favorite was the one with ika and noodles. After that food-coma inducing lunch, Angelica left for class and I went downstairs for a visit to Yodobashi Camera. It's basically eight floors packed with high-tech goodies and accessories; if you're into technology a visit to a Yodobashi or Bic Camera is a must on your to-do list! I still had some daylight left so decided to head down to Tennoji to check out Shitennoji temple and the Osaka Municipal Museum of Art. The area is pretty run down compared to downtown Osaka and is filled with Pachinko and Pachislo parlours. There is what seems to be the equivalent of a night market at the station, however, which was neat to see, but I never did find Shitennoji (there are few signs and I didn't walk far enough, apparently). I did find the museum though, which is small but for 300 yen was very nice; it has some really nice 6th century Chinese Buddhist stone carvings, Chinese and Japanese paintings on silk (dating from 6th to 17th centuries), and Japanese brush paintings from more recent times (18th and 19th centuries). The museum displays are spartan, as is the building, but it was still quite enjoyable. That pretty much ended the day; now to decide what to do today - it will either be a day trip to Koya-san, another attempt at finding the elusive Shitennoji, or a trip to Kobe. Stay tuned to find out!